It is a localized defect in the alveolar bone which exposes the apical or medium third of the root surface but does not involve the alevolar margin. 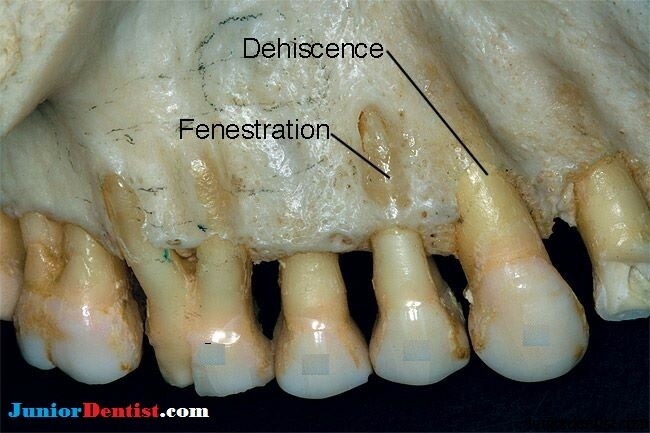 Dehiscence are isolated areas in which root is denuded of bone and root surface is covered by periosteum and overlying gingiva but the denuded are extends through the Marginal Bone. In Dehiscence there is no bone on one side of it (coronally) and is measured with the use of graduated periodontal probe. The loss of bone is at least 4 mm apical to the margin of the inter-proximal bone. The causes for Fenestration and Dehiscence is not known and the etiology is usually mentioned as unknown. Both Fenestration and Dehiscence cannot be identified clinically or radiographically and are only seen during surgery or by probing in case of dehiscence. Treatment depends on the cause as stated above.